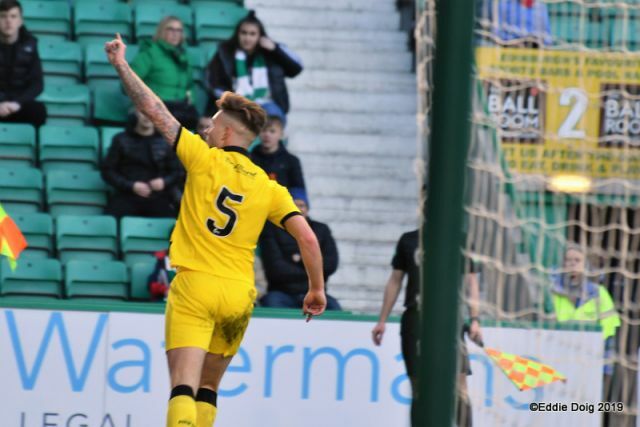 Raith’s Scottish Cup run came to an end with defeat at Easter Road to a strong Hibernian side, with an energetic first-half performance from Eddie May’s men enough to secure their quarter-final place, despite a late Raith rally. 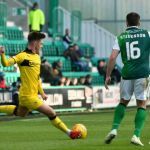 Goals from Stevie Mallan, Vykintas Slivka, and a splendid third from Marc McNulty were enough for Hibs to overcome a spirited Rovers side, for whom Euan Murray headed in a late consolation. 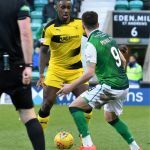 Although Raith matched their opponents for spells, the quality of Hibs’ possession through midfield advertised the difference between the sides – John McGlynn’s men were unable to stop the flow of quality service to striker McNulty. 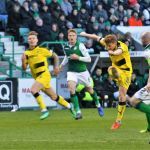 For Hibs, a quarter-final in prospect; for Raith, focus now on preparation for another round of promotion play-offs at the season’s end. 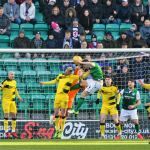 With nine full Supporters’ Club buses amid a cavalcade of travelling fans, Raith started with boisterous support behind them. 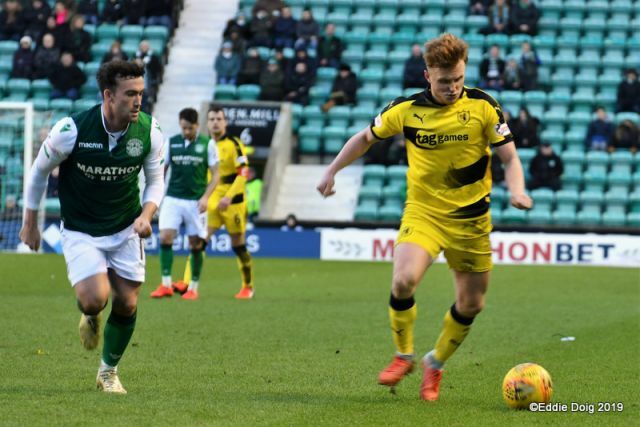 Robbie Thomson regained his place in goals, and wide midfielder Nathan Flanagan was recalled at the expense of Chris Duggan – manager John McGlynn planning an assault from wide areas rather than Duggan’s more muscular presence in the forward line. 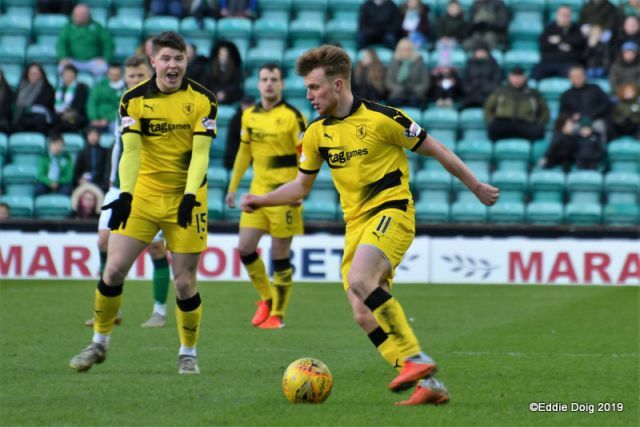 With 2014’s 3-2 Cup win still as fresh in the mind as if it were yesterday, Raith’s two thousand-strong travelling contingent belted out support for their heroes from the opening minutes. 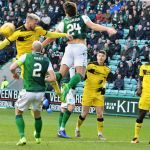 Hibs’ season to date has been as turbulent off the pitch as on it. 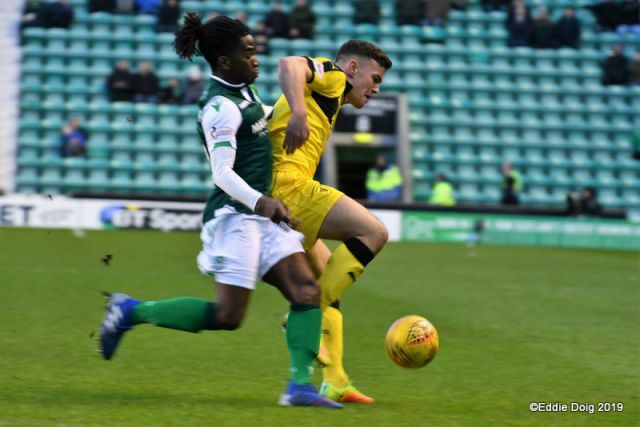 With speculation about the vacant manager’s position swirling around the media with as much force as the wintry breeze in Edinburgh’s eastern suburbs, the Easter Road backroom team had been striving to keep players’ minds focussed on footballing matters – Oli Shaw dropped to bench, still nursing a knock from the midweek defeat at Parkhead, with Ryan Gauld and Academy graduate Sean Mackie also both dropping out. 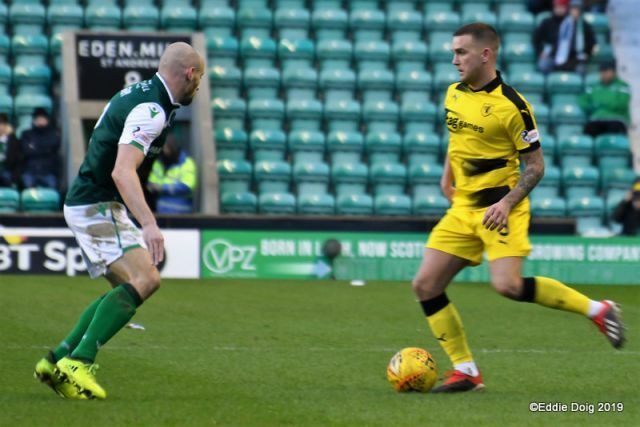 The experienced Stevie Mallan, new striker Marc McNulty, and Daryl Horgan – scorer of two against Elgin in the previous round – took starting positions. 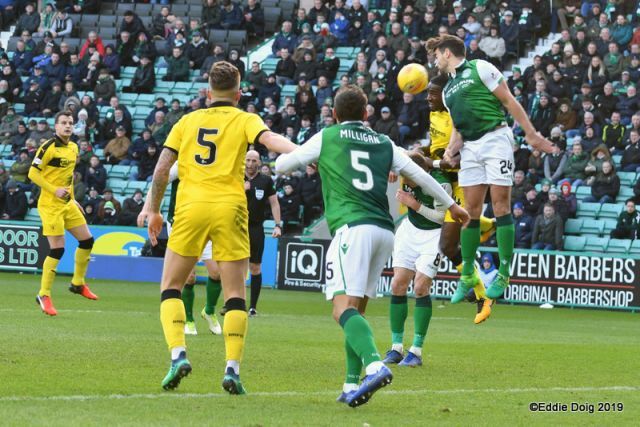 Despite Hibs’ inconsistent form, at their best the Easter Road side are an attacking match for anyone in the country, with precise passing and pace through the middle, although with a defensive core that had been more porous this season than in previous years. 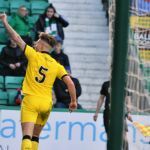 With Rovers resplendent in their change yellow jerseys on the pristine green of the Easter Road pitch, blue and white balloons flew across the pitch just before kick-off. The colourful scene was complete with the suggestion of a rainbow high in the sky to the east – a perfect setting for an afternoon of flowing attacking football. 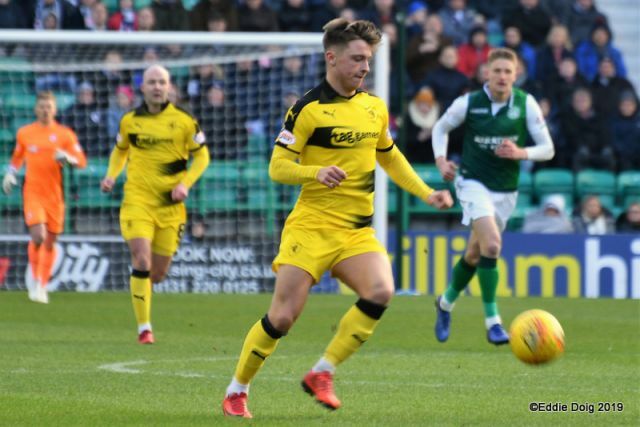 Nisbet pressed up against Hibs’ central defenders, but more importantly, Flanagan and Dingwall had to sit deep from the first minutes – the success of Raith’s 4-5-1 formation would depend on stout defence and support for their lone striker. 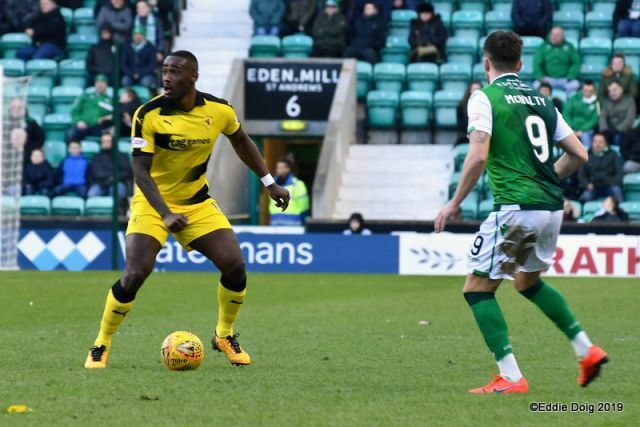 The home side held possession in the early stages, forcing two corners as the game’s opening paragraphs were written in Raith territory. 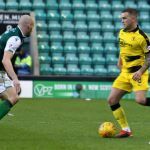 Gray looked to attack from wide on the right, pinning Dingwall back alongside Crane in the left-back area. 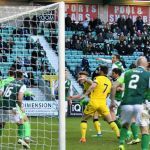 The first chance came from a corner – McNulty having space to shoot, Davidson keeping the scores level with a good block. 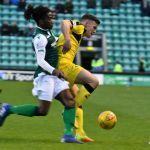 The on-loan Reading striker McNulty, playing his first match at Easter Road, would be a constant thorn in the Rovers’ rearguard – he already looks a shrewd investment for Eddie May’s side. 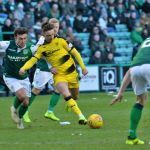 The match was eight minutes old before Raith troubled the Hibs’ defence – Crane stepping away from McGregor and nearly slipping Nisbet in. Kamberi’s shot flew high over Thomson’s bar in the tenth minute from the home side’s third corner kick. 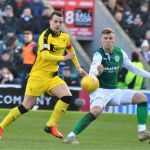 Having survived the first ten minutes, Raith began to commit numbers forward. Twice Nisbet dropped deep to play in Flanagan, with Stevenson trailing in his wake. 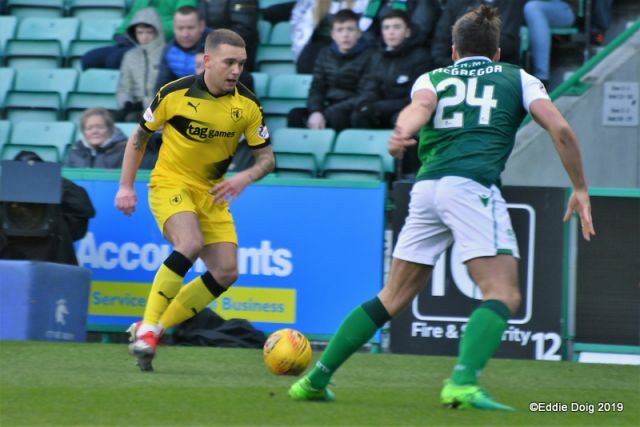 Dingwall’s powerful strike from distance needed a strong hand from Marciano. 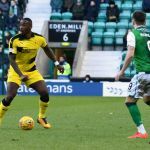 At the other end, Kamberi’s weak header was comfortably gathered by Thomson with fourteen minutes on the clock. 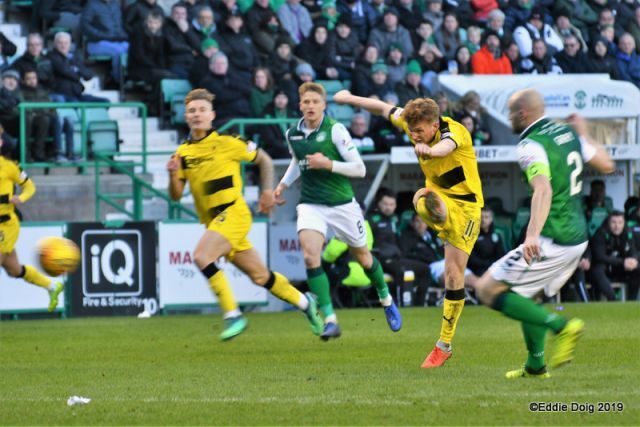 The first real moment of quality came on fifteen minutes, nearly putting the home side a goal to the good – with Horgan and Slivka working space in the right channel, Mallan had time to set himself; his shot zipped just wide of Thomson’s far post. 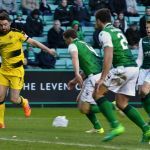 Gray escaped behind Crane, firing dangerously across goal – Bendictus blocked Kamberi at the near-post, Gillespie completing the clearance. 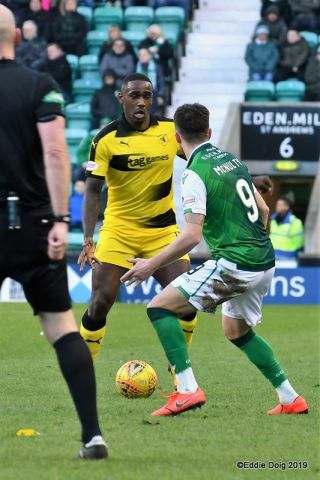 Raith’s first corner allowed both Davidson and Benedictus forward – the former’s presence in the six-yard box causing predictable torment in the home defence. 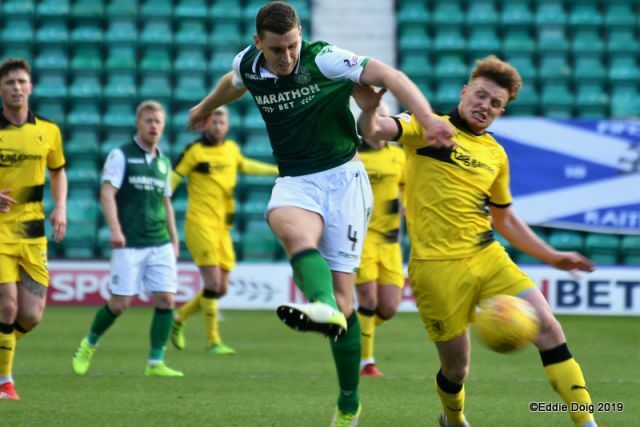 On twenty-one minutes, a fine goal to put Hibs one up. Slivka’s driving run in the inside right channel drew defenders, leaving Daryl Horgan with room on the edge of the area. 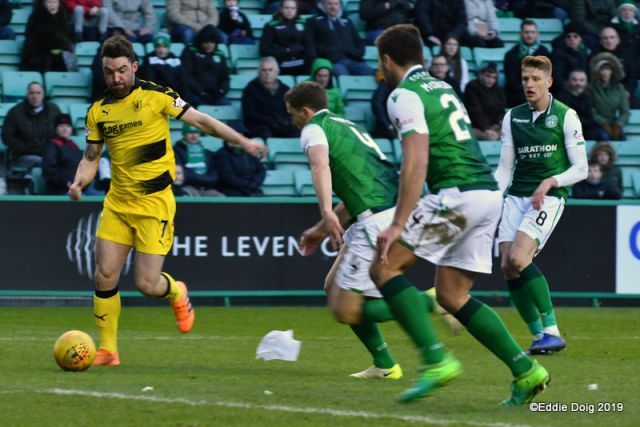 Stepping away from Gillespie, the prolific midfielder curled a lovely strike wide of Thomson, into the keeper’s right-hand corner. 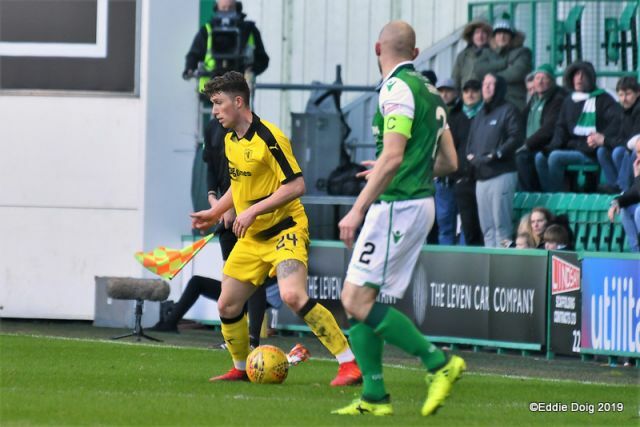 Raith fought back immediately – Flanagan drove beyond Stevenson, a late challenge preventing a clear strike on goal; Wedderburn’s one-two with Nisbet gave the midfielder time to curl a delightful cross through Marciano’s six-yard box, Hanlon at his best to guide the ball to safety. 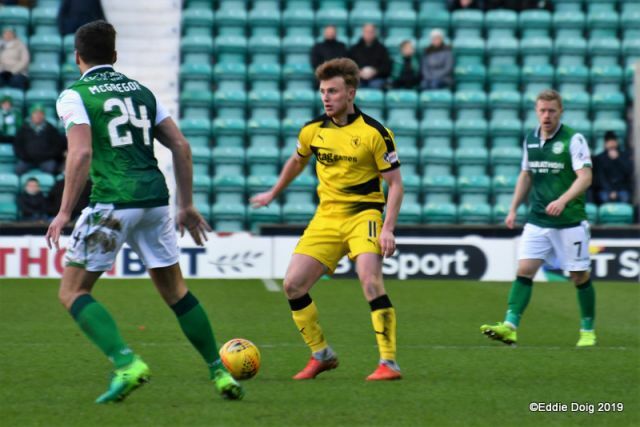 Barjonas’ fine run and cross had Dingwall at full stretch, heading just wide – the disquiet in the home support testament to the quality of Raith’s. 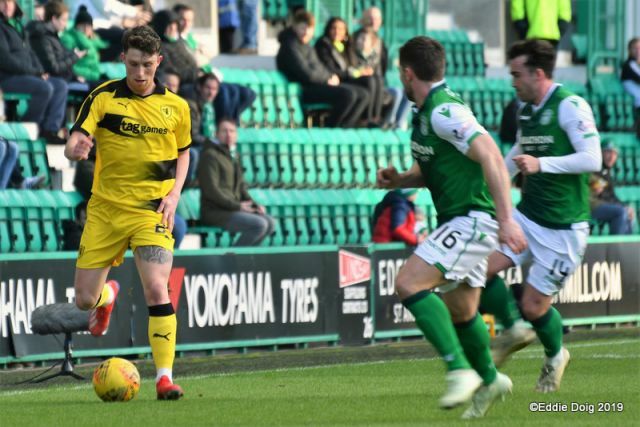 Mallan blasted wide from twenty yards, as Hibs tried to re-establish superiority. 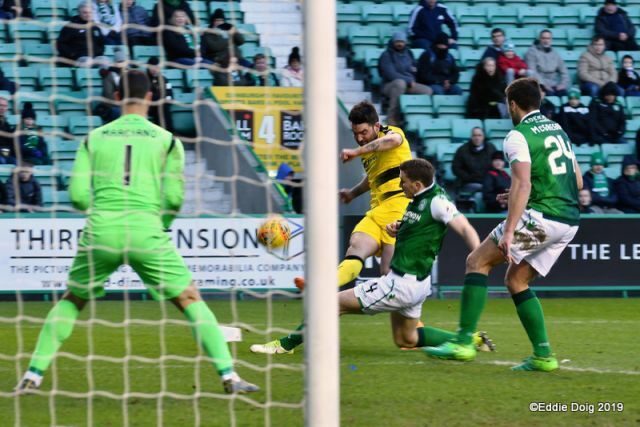 Rovers’ Maginot Line was exposed down both channels regularly and often – the two-goal margin indicative of the greater threat posed by Eddie May’s side. Raith looked to begin the second half on the front foot, Dingwall crossing early just beyond Nisbet. 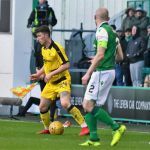 Murray and Gillespie appeared in forward areas – released by Dingwall, Murray fired just over Marciano’s bar on forty-seven minutes; Flanagan and Nisbet exchanged neat passes, allowing the Raith winger to shoot just over. 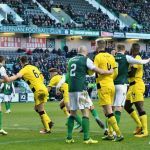 The open spaces in wide areas provided fertile ground for Hibs to sow the seeds of an eventual third. Gray on the right and Stevenson from the left provided a regular stream of quality service into McNulty and Kamberi. 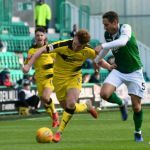 Dingwall and Flanagan, looking to push on, left spaces to be exploited. 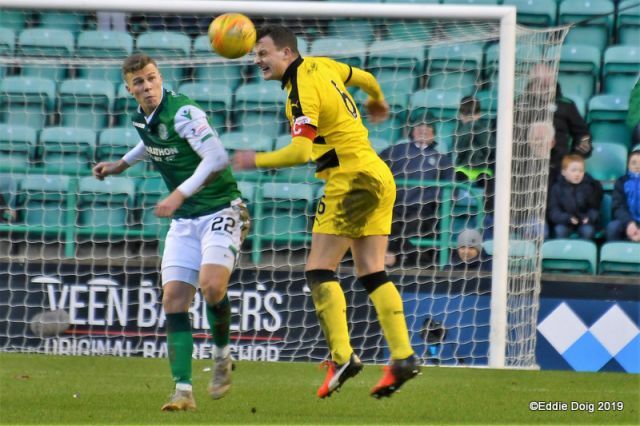 With the half ten minutes old, the next goal would be crucial – a Rovers strike would surely require changes in Hibs’ formation; a Hibs third would seal the tie. 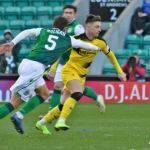 Horgan’s snapshot flashed away from Thomson’s goal with team-mates better placed. Mallan’s delicate curler rippled the side-netting, inches wide. 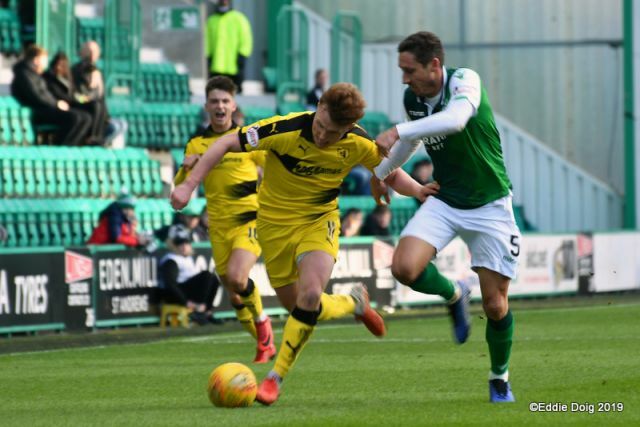 Moments later, McNulty put the tie beyond Raith – Dingwall lost possession in midfield, and Horgan slipped a ball over Davidson’s head into the path of the Hibs striker. 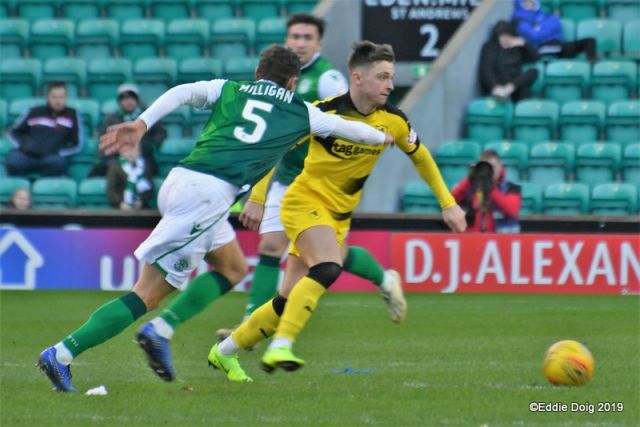 Controlling well with his first touch, McNulty confidently stroked his finish through the advancing Thomson, taking the plaudits of the home fans as his strike found the net. 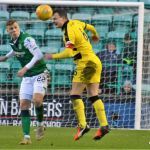 Kamberi, stepping away from Gillespie and out-running Davidson, could have had a fourth, the Swiss striker’s tame finish straight into Thomson’s welcoming grasp. 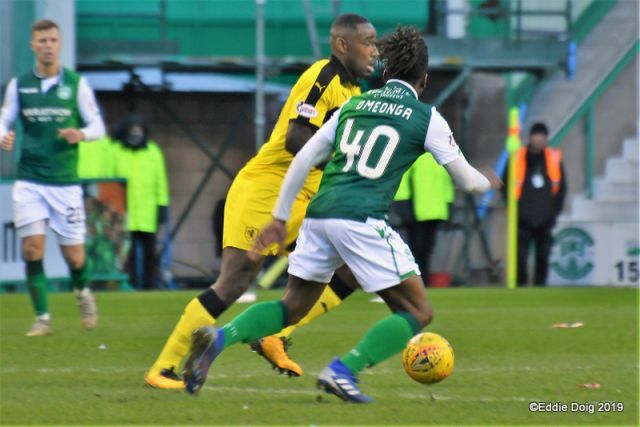 With twenty minutes to go, McNulty’s lovely cross on the run fell just beyond Kamberi, who had a step on Benedictus but couldn’t make contact. 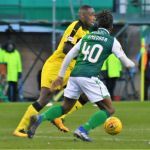 The introduction of Stephane Omeonga brought another burst of pace to the Hibs front-line. Attacking from the right flank, the Frenchman played in Kamberi, whose turn and shot was deflected wide. 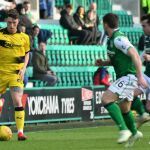 Substitute Chris Duggan’s presence began to have an influence also – using his stature to create space, the striker bundled his way past Hanlon, and only Gray’s intervention prevented a clear strike on goal. 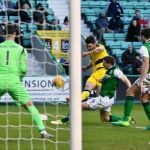 With the resultant corner, Murray won the race to the near post, heading beyond Marciano to put Raith on the score-sheet. 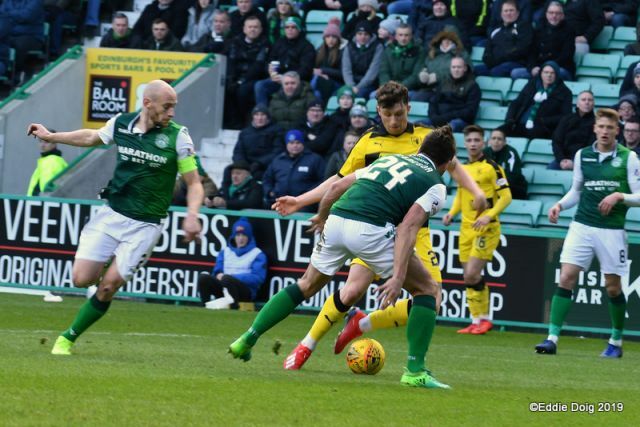 McGregor’s weak defensive header conceded another corner seconds later – with Raith’s travelling support on their feet, Flanagan’s cross fell just beyond Davidson. 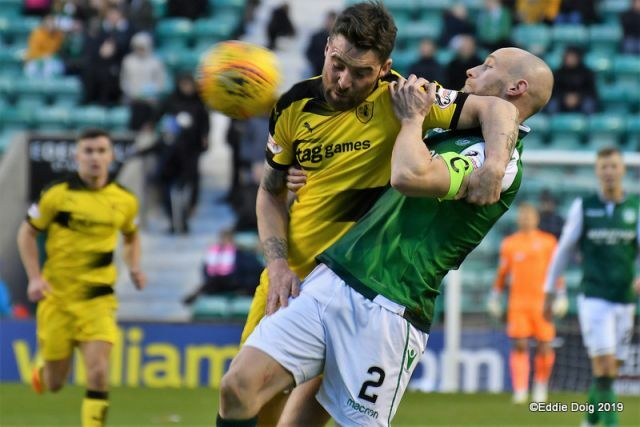 Murray again caused chaos on the home defence, heading another Flanagan cross just wide. Raith undoubtedly had their tails up. With Matthews giving added numbers in midfield, Dingwall’s fierce drive required safe hands from Marciano. 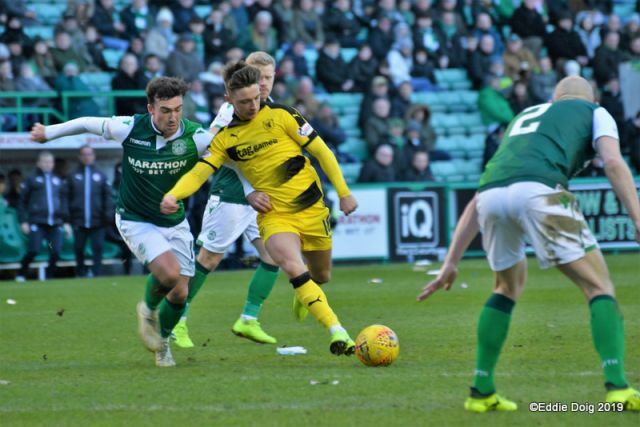 Crane tormented Gray on the left flank – only a wonderful recovery tackle from the Hibs captain prevented Crane crossing with Duggan well placed. A counter from the home side saw Kamberi’s shot fizz just wide. 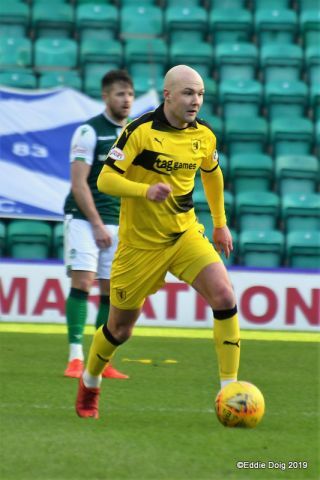 Perhaps in recognition of Rovers’ late threat, Oli Shaw was brought on to draw the attention of the Raith defence – the striker’s first run at Davidson producing a corner. Slivka should have done better in injury time, taking too long to shoot, allowing Benedictus to recover. 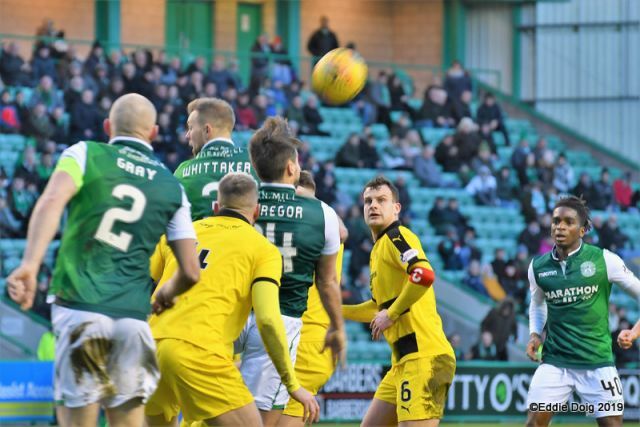 With Hibs experienced enough to see out the remaining minutes, referee Bobby Madden’s final whistle put Hibs into the hat for the Cup quarter-finals, leaving Raith to take the plaudits of their sizeable travelling support, having fallen at the fifth-round stage of this season’s Scottish Cup. 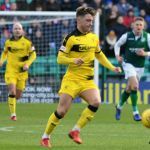 With several League games to go, Rovers’ challenge for the remainder of the season will be to assert their authority over their nearest rivals, heading into the League finale with confidence and momentum. 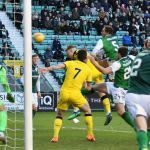 Today, though, was Hibernian’s day. Good afternoon from a windy, but not too cold Easter Road. 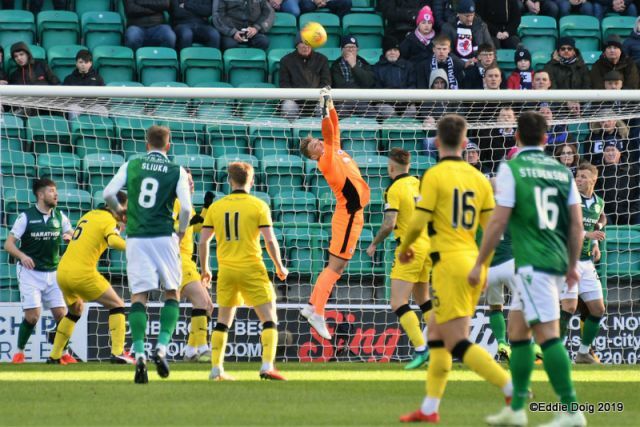 Team news is Robbie Thomson is back in goals. Impressive away support arrived early and making noise. 2/3 of the bottom tier and half of the top tier of the South Stand. 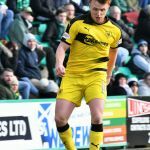 Rovers will be playing in their yellow and black away strip. Tannoy update: ‘Don’t You Forget About Me’ - Simple Minds. Benedictus leads the team out. Blue and white balloons all over the pitch! 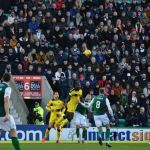 Hibs kick off, shooting into the away end. Corner straight out for a goal kick. 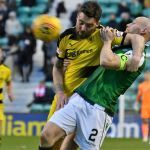 Chance for Hibs deflected away. That could have been a goal. Davidson down in box holding his back. Ref stops play. Nesbit kicks ball to goalie from the drop ball. Not sure if that’s a shot on goal?! Seems to be a solid 4-1-4-1 set up for Raith, with Nesbit the lone striker. Crane attempts to thread Nesbit through, but out for goal kick. First attack of the game for Rovers. 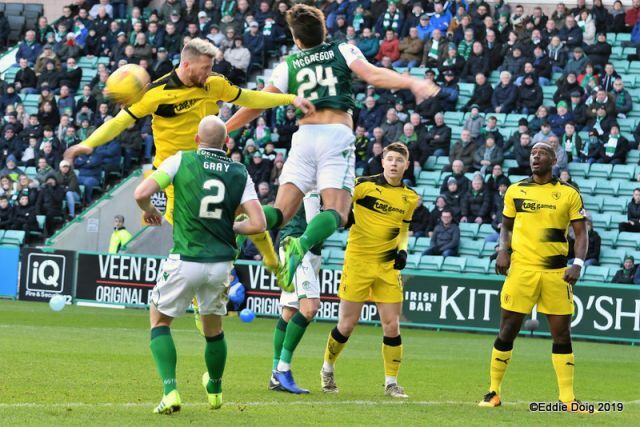 Cross off Crane’s back and it’s a Hibs corner. Kamberi shoots well over the bar. 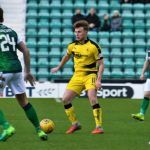 Rasping drive from Dingwall. 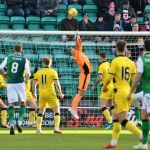 Hibs goalie dives full stretch to palm away. Mallan shoots just past the post. That was close. Davidson clears in the box. 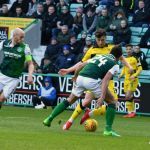 Kamberi sclaffs a free header in the box and Thomson easily holds. Davidson can’t connect. Out for a Rovers throw. More great work from Slivka and Horgan scores high into the net. 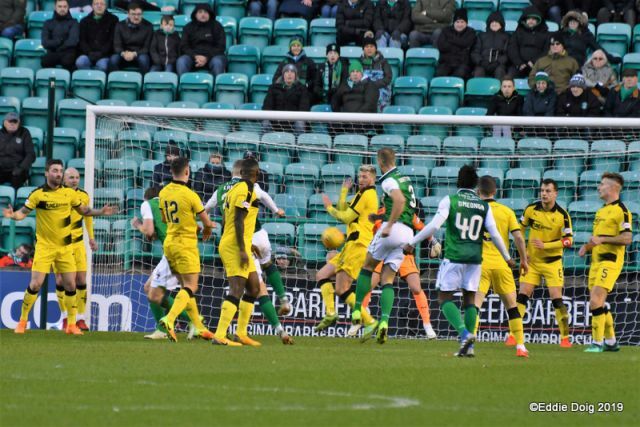 More pressure from Raith and another corner. 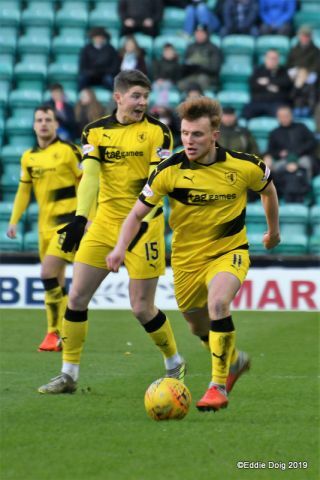 Dingwall headers just wide from a great Barjonas run. Just wide from Mallan. 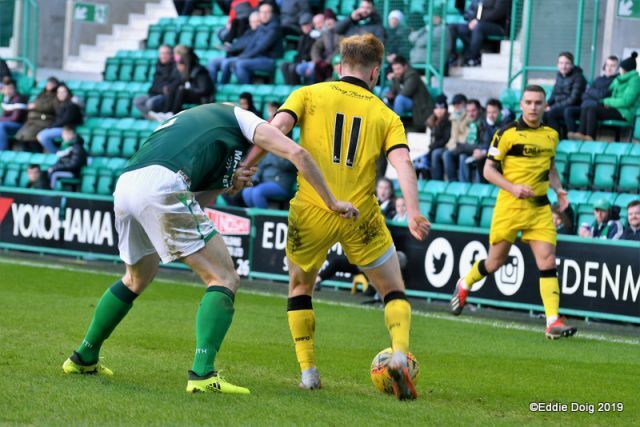 Raith need to be wary of giving him too much space. Free kick 40 yards out for Raith. Flanagan over hits pass with Murray in acres of space down the right wing. 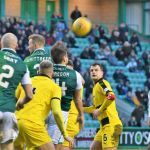 Free kick Hibs on halfway line. 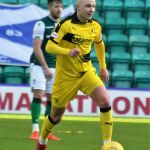 Raith can’t clear and Slivka buries his shot low past Thomson. 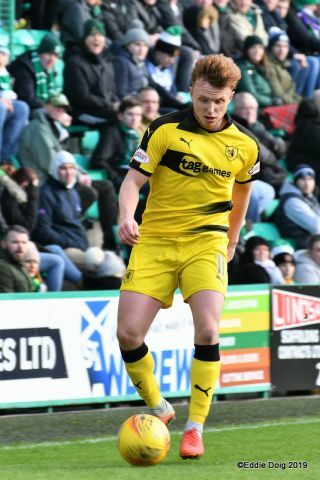 Free kick Raith. Barjonas to take it. 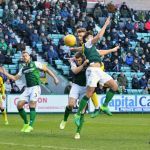 Half time: Hibs 2-0 Raith Rovers. 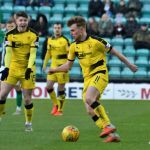 A real shame for Raith, who have played well. Rovers have definitely shown they can threaten. Will be very interesting if they score first in the second half. Thomson first out of tunnel for the second half. Dingwall kicks off for the Rovers. Murray rifles over from just inside the box. Davidson heads clear for a corner. Slack Murray pass puts Davidson in all sorts of trouble. 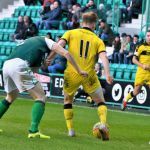 Hibs break, but comes to nothing. Horgan shoots a yard past the post. Mallan curls it just past post. 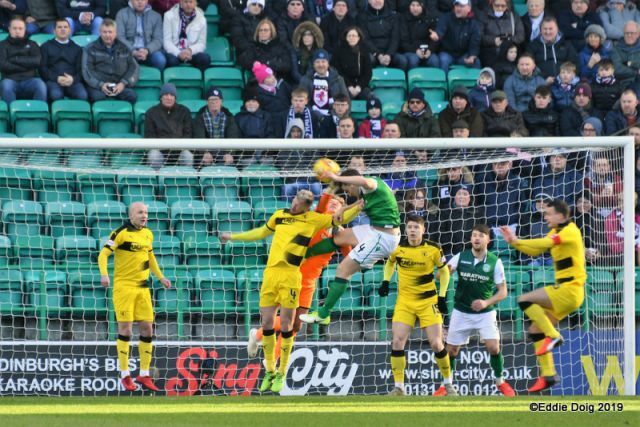 A few Hibs fans thought that was in. 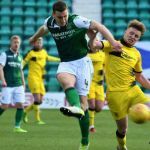 McNulty goes clean through down the left side and calmly buries under Thomson. Impressive run from Slivka. Shot easily held by Thomson. Slivka runs onto a lovely low cross but forgets to kick the ball. Danger averted. Slivka shot deflected and loops wide if the target. 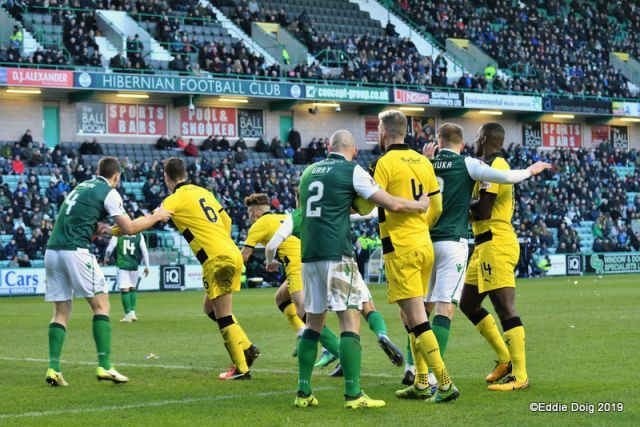 Corner Hibs. 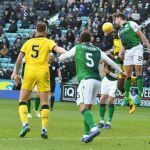 Hibs have been more impressive in the second half. Flanagan’s corner met by MURRAY in line with near post and he headers home. 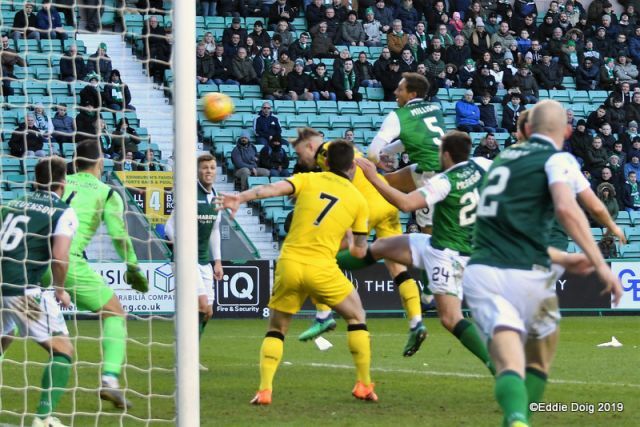 75 mins - Hibs 3-1 Raith. 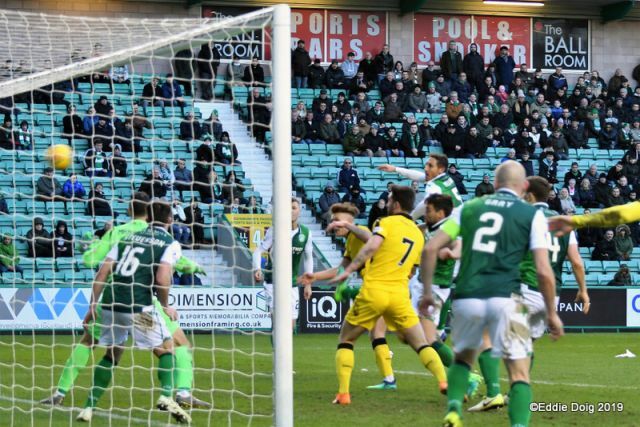 Mistake from Hibs and Raith have a corner. 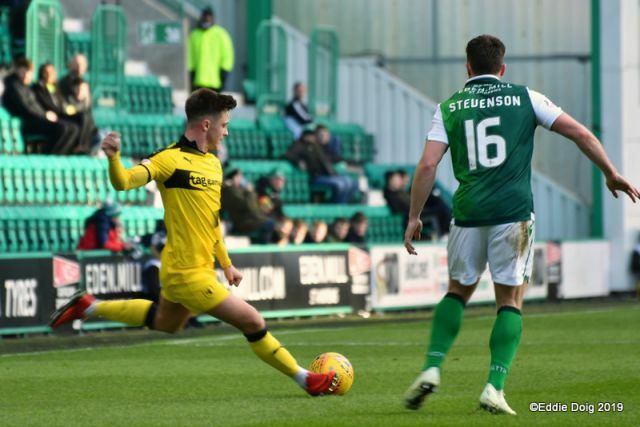 Flanagan’s cross just too high for Davidson at far post. 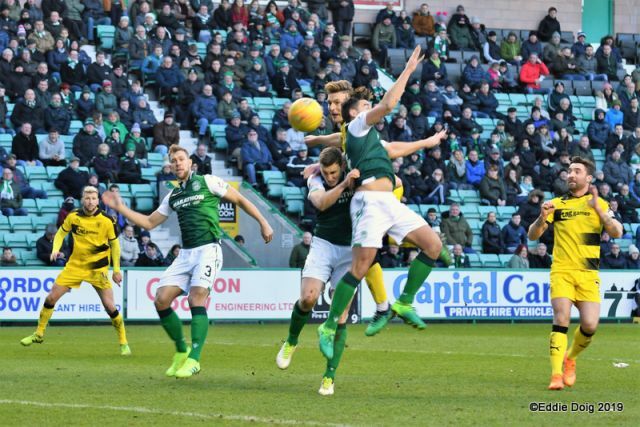 Another header from Murray, but just past post. Fair old ‘oooooooooh’ from the away support. Raith in control for last few minutes. Dingwall shoots straight at keeper. Great take from Gray stops a dangerous Crane run. 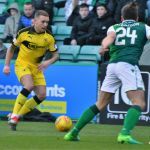 McNulty off and replaced by Shaw. Flanagan just can’t get his cross into the danger zone. 3 additional minutes of play.